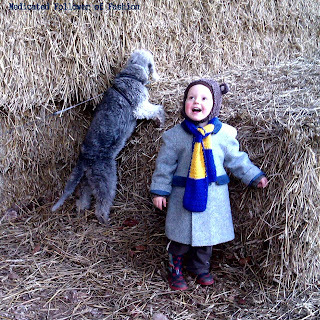 Medicated Follower of Fashion: Trendy Toddler Tuesday - Smart, Smart, Baby! It's Trendy Toddler time everyone! I love joining in with this Meme held by Very Busy Mama and adorable Little M over at Mummy's Busy World. 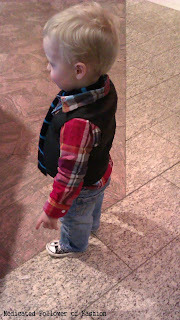 This is an outfit Ethan rocked at the weekend. It's very cold at the moment.. as I'm sure it is with many of you reading this. We've still not had any snow in this part of the country though - well, not enough that it has settled anyway!! But, as I said, it is cold, and Ethan and I have been all about the layers. Ethan wears tights. I have no issue with this whatsoever. In fact, in many countries, it's not unusual for boys to wear tights. You can even buy them for boys - which I have done online! 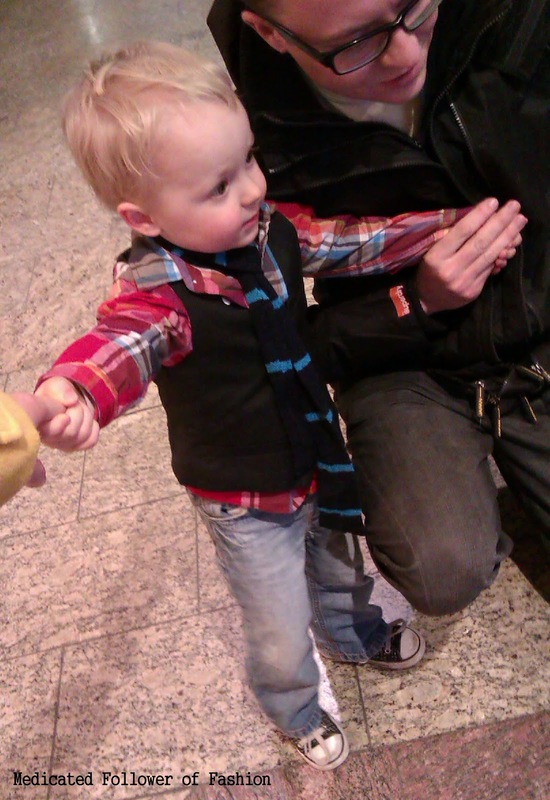 So.. Ethan has been wearing lots of layers; tights, socks, leg warmers, trousers, vests, tops, shirts and waistcoats! I've got a few pics to show off today, I hope that's not cheating! Hidden out of view are all the layers! This photo is an extra for today - not taken on the same day, and not the same outfit, but it's such a cute pic and shoes Ethan wearing a gorgeous coat that was my brothers in around 1988. It still looks perfect and is very warm. Ethan has fallen for it and calls it his "very smart coat". There's no brand label inside the coat, but from the font used on the age/care label, my educated guess would be Boots or Mothercare. Scarf: Crochet scarf made by one of the ladies from our local library! If you're joining in with Trendy Toddler Tuesday, don't forget to let me know!! Or if you've not joined in before, why not pop along to Busy Mama's blog and check it out. Oh, as an extra, extra bonus, here's Ethan in his undergarments, looking like a little Billy Elliot! I got his tights on eBay, listed as boys tights! Thanks for looking, and thank you in advance for your comments - I love to know what you think about Ethan's outfits! Oh wow. Stunning. The picture of Ethan in his vinatage coat by the hay looks like a photo shoot or out of a magazine. That is certainly going up on my pin board. I really like seeing clothing that belonged to you or the family. Most of us just give it away and not bother keeping it. Thanks so much for joining in. I enjoy seeing so many looks and of course find new things for our gorgeous boys to wear! The scarf is fab, isn't it! I love that it was crocheted locally by our librarian.. and Ethan chose it himself! Love the photos, you are right about the tights, when we went to Japan, I remember seeing little boys that were about 5 or 6 years old wearing tights under their shorts as part of their school uniforms.